I think this may be the last year I will be able to convince my two kids to do joint costumes. Nicole’s love of all things astronaut did not transfer to Alexis. We went through quite a few negotiations to get her into her orange jumpsuit for our costume dry run. She’s actually wearing her favorite dress underneath. Hey, whatever works! Other than getting the kids suited up, our costume dry run went well. 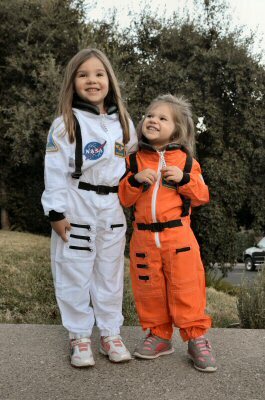 Both girls had a lot of fun posing as astronauts, gazing into the distance and pointing up at the pretend stars. We did a little mock trick or treating as well, since I’m not planning on bringing my camera for the day. Any photo shoot that ends with candy is a win in their book. I have the most ridiculously bad luck when ordering Halloween costumes online. I had an issue with Nicole’s Wonder Woman costume last year. The first costume came ripped, and even though it was still early October the store couldn’t guarantee a replacement in time. In fact, the replacement wasn’t guaranteed to arrive until November 28th! This year I decided to order in late September to be safe, and it’s a good thing I did as I ended up making four separate purchases! The plan since August has been for Nicole to be a white astronaut and Alexis to be an orange astronaut. The first problem was I wasn’t sure of the girls’ sizes. Alexis was sometimes in a 3T and sometimes in a 4T, Nicole was pretty solidly in the 5-6 range. the costume comes in 4-6x and 2-3T. I was sure Alexis would be a solid 4T by Halloween, but there’s a six inch height difference between the kids! I couldn’t believe they’d be in the same size costume with such a large height difference. Since the 4-6x would definitely fit at least one of my kids and the orange version was on sale, I ordered it. It was big, but not ridiculously big on Alexis. It fit Nicole well, but Nicole’s heart was set on the white astronaut. So I ordered the 4-6x in white, and the 2-3T in orange. The 2-3T in orange fit Alexis just right. Perhaps it was a hair small, but the kind of thing that would only be noticeable to mom. I didn’t want to return the 4-6x, just in case Alexis hit a growth spurt between early September and now. It still has the tag, but we’re outside the return window. I haven’t decided whether it’ll go to the dress up corner, or I’ll donate it. The white astronaut costume was a disaster. The company sent an Adult small instead of a child’s 4-6x. It was a different, much cheaper brand which didn’t have the accessories. The benefit of having ordered the first 4-6x in orange, I guess, was that it was immediately apparent to me that the mistake was on the costume company, and not mine. Everything other than the color was supposed to be exactly the same. I didn’t hesitate to return that one. At least it was still early enough to order from someone else. Oh well, at least the kids look great and what’s one extra costume at the end of the day?